1. An upper end which is called the iliac crest. 2. A lower end which is smaller, and is fused with the pubis and the ischium at the acetabulum. The ilium forms the upper two-fifths of the acetabulum. 3. Three borders—anterior, posterior and medial. 4. Three surfaces—gluteal surface, iliac surface or iliac fossa, and a sacropelvic surface. These parts are described one by one below. The iliac crest is a broad convex ridge forming the upper end of the ilium. It can be felt in the living at the lower limit of the flank. Vertically it is convex upwards, anteroposteriorly, it is concave inwards in front and concave outwards behind. 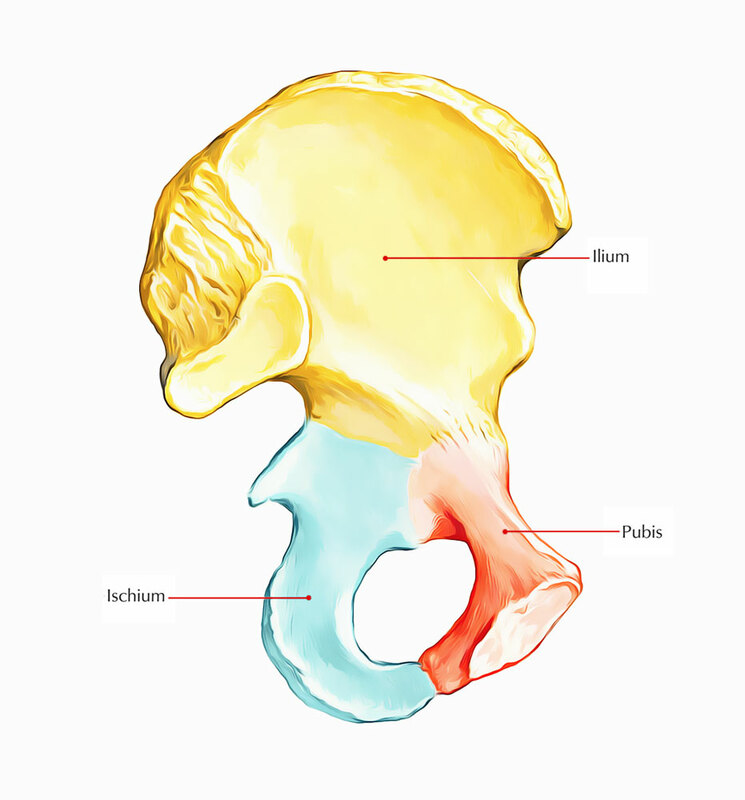 The highest point of the iliac crest is situated a little behind the midpoint of the crest. It lies at the level of the interval between the spines of vertebrae L3 and L4. The anterior end of the iliac crest is called the anterior superior iliac spine. This is a prominent landmark that is easily felt in the living. The posterior end of the crest is called the posterior superior iliac spine. Its position on the surface of the body is marked by a dimple 4 cm lateral of the second sacral spine. Morphologically, the iliac crest is divided into a long ventral segment and a short dorsal segment. The ventral segment forms more than the anterior two-thirds of the crest. It has an outer lip, an inner lip, and an intermediate area. The tubercle of the iliac crest is an elevation that lies on the outer lip about 5 cm behind the anterior superior iliac spine. This border starts at the anterior superior iliac spine and runs downwards to the acetabulum. The upper part of the border presents a notch, while its lower part shows an elevated area called the anterior inferior iliac spine. The lower half of this spine is large, triangular and rough. This border extends from the posterior superior iliac spine to the upper end of the posterior border of the ischium. A few centimeters below the posterior superior iliac spine it presents another prominence called the posterior inferior iliac spine. Still lower down the posterior border is marked by a large deep notch called the greater sciatic notch. It extends on the inner or pelvic surface of the ilium from the iliac crest to the iliopubic eminence. It separates the iliac fossa from the sacropelvic surface. Its lower rounded part forms the iliac parts of the arcuate line or inlet of pelvis. 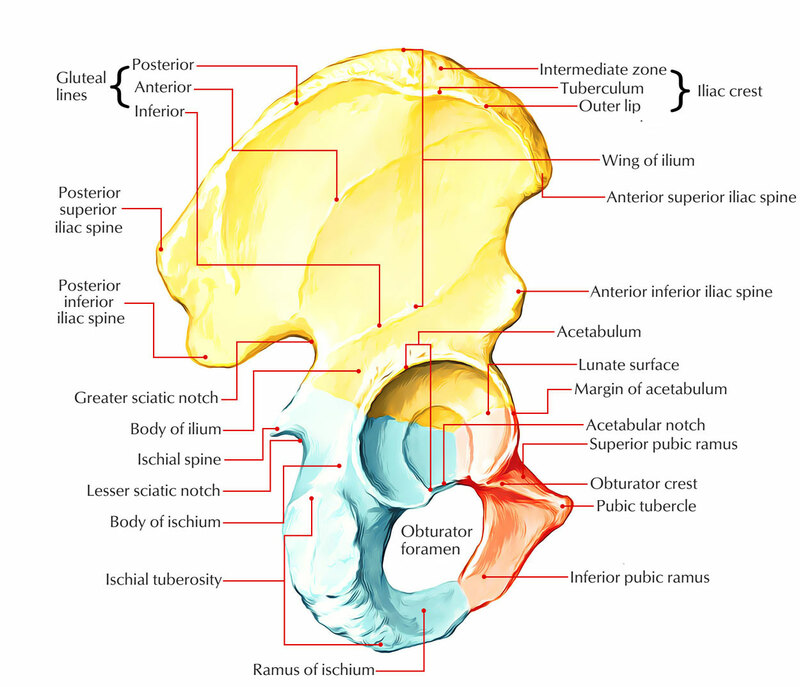 This is the outer surface of the ilium, which is convex in front and concave behind, like the iliac crest. It is divided into four areas by three gluteal lines. The posterior gluteal line, the shortest, begins 5 cm in front of the posterior superior spine, and ends just in front of the posterior inferior spine. The anterior gluteal line, the longest, begins about 2.5 cm behind the anterior superior spine, runs backwards and then downwards to end at the middle of the upper border of the greater sciatic notch. The inferior gluteal line, the most ill-defined, begins a little above and behind the anterior inferior spine, runs backwards and downwards to end near the apex of the greater sciatic notch. This is the large concave area on the inner surface of the ilium, situated in front of its medial border. It forms the lateral wall of the false pelvis. This is the uneven area on the inner surface of the ilium, situated behind its medial border. It is subdivided into three parts; the iliac tuberosity, the auricular surface and the pelvic surface. The iliac tuberosity is the upper, large, roughened area, lying just below the dorsal segment of the iliac crest. It is raised in the middle and depressed both above and below. The auricular surface is articular but pitted. It lies anteroinferior to the iliac tuberosity. It articulates with the sacrum to form the sacroiliac joint. The pelvic surface is smooth and lies anteroinferior to the auricular surface. It forms a part of the lateral wall of the true pelvis. Along the upper border of the greater sciatic notch, this surface is marked by the preauricular sulcus. This sulcus is deeper in females than in males. 1. The anterior superior iliac gives attachment to the lateral end of the inguinal ligament. It also gives origin to the sartorius muscle; the origin extends onto the upper half of the notch below the spine. (b) origin to the tensor fasciae latae in front of the tubercle; (c) insertion to the external oblique muscle in its anterior two-thirds; and (d) origin to the latissimus dorsi just behind the highest point of the crest. The tubercle of the crest marks the point of maximum traction by the iliotibial tract. 3. The inner lip of the iliac crest provides (a) origin to the transversus abdominis in its anterior two-thirds; (b) attachment to the fascia transversalis and to the fascia iliaca in its anterior two-thirds, deep to the attachment of the transversus abdominis; (c) origin to the quadratus lumborum in its posterior one-third; and (d) attachment to the thoracolumbar fascia around the attachment of the quadratus lumborum. 4. The intermediate area of the iliac crest gives origin to the internal oblique muscle in its anterior two-thirds. 5. The attachments on the dorsal segment of the iliac crest are as follows, (a) The lateral slope gives origin to the gluteus maximus. (b) Themedial slope gives origin to the erector spinae. (c) The interosseous and dorsal sacroiliac ligaments are attached to the medial margin deep to the attachment of the erector spinae. 6. The upper half of the anterior inferior iliac spine gives origin to the straight head of the rectus femoris. The rough lower part of this spine gives attachment to the iliofemoral ligament. 7. The posterior border of the ilium provides (a) attachment to the upper fibres of the sacrotuberous ligament above the greater sciatic notch; and (b) origin to a few fibres of the piriformis from the upper margin of the greater sciatic notch. 8. The attachments on the gluteal surface are as follows. (a) The area behind the posterior gluteal line gives origin to the upper fibres of the gluteus maximus. (e) The capsular ligament of the hip joint is attached along the margin of the acetabulum. 9. The iliac fossa gives origin to the iliacus from its upper two-thirds. The lower grooved part of the fossa is covered by the iliac bursa. (a) the interosseous sacroiliac ligament in its greater part, (b) the dorsal sacroiliac ligament posteriorly, and (c) the iliolumbar ligament superiorly. 11. The convex margin of the auricular surface gives attachment to the ventral sacroiliac ligament. 12. The attachments on the pelvic surface are as follows. (a) The preauricular sulcus provides attachment to the lower fibres of the ventral sacroiliac ligament. (b) The part of the pelvic surface lateral to the preauricular sulcus gives origin to a few fibres of the piriformis, (c) The rest of the pelvic surface gives origin to the upper half of the obturator intemus.